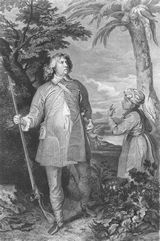 'William Feilding, 1st Earl of Denbigh with an Indian servant', was painted by Sir Anthony Van Dyck in 1633-4, probably for the sitter, who then gave it to James, 3rd Marquis and later 1st Duke of Hamilton, his son-in-law. Painted in oil on canvas, it measures 247.5 x 148.5cm. The Earl of Denbigh (c.1582-1643) travelled to India in 1631-3, to visit the Mughal Court, and he is seen in a red and gold Indian or Hindu suit, apparently out hunting. By his side stands his young Indian servant, pointing to a parrot in the palm tree above. The painting was in the Hamilton Collection from at least 1643 until the sale of Palace furnishings in 1919. It was then in private hands until it was presented by Count Antoine Seilern to the National Gallery of London in 1945.